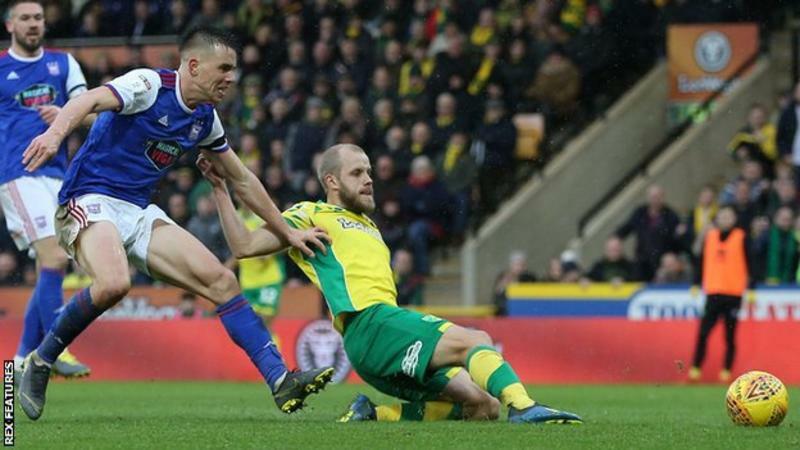 Ipswich boss Paul Lambert was sent off on his return to Carrow Road as Norwich won the East Anglian derby to move two points clear at the top of the Championship. Tempers flared after Jon Nolan's late challenge on Max Aarons in first-half stoppage time and ex-Canaries manager Lambert was sent to the stands after confronting Norwich coach Chris Domogalla, who was also red-carded. The hosts had led after just 82 seconds when Onel Hernandez steered in from close range to score Norwich's fastest league goal since 2011. Teemu Pukki drilled low across Bartosz Bialkowski to make it 2-0 and the Finland striker poked in a third on the stretch for his 20th Championship goal of the season. Norwich moved clear of Leeds, who drew at Middlesbrough on Saturday, while Ipswich stay five points adrift at the bottom and nine from safety. Lambert, who won two promotions in his three years in charge of Norwich, said he did not have a problem with referee Peter Bankes' decision to show him a red card. Norwich boss Daniel Farke said: "I have a lot of time for Paul Lambert and 95% of the Ipswich staff are fine but there are one or two guys - you can lose a game, but show a little bit of class, quality and style. "I was a bit annoyed to be honest with how they handled it. Respect human beings and the words you choose, because there are children around and there are more important things in life than football. "Some of their staff who were not so much in the spotlight - my feeling was they wanted to use today in order to prove something and I think you'd better not do this when you're in this position in the league." Lambert responded: "I don't think he should be commenting on my staff. I certainly won't have him talking about my staff. He should look at his own staff first before he comments on anyone else's. "The referee sent off the wrong guy for them. It wasn't that guy that I was arguing with." The score flattered the hosts, who scored with their only three shots on target and only 47% possession. They were put under pressure by Ipswich early in the second half, Alan Judge striking just wide from the edge of the box a minute before Pukki made it 2-0. But the Tractor Boys once again lacked a cutting edge and look likely to be playing in League One next season. Both of Pukki's goals were supplied by through balls from Norwich playmaker Emi Buendia, while Pukki had another disallowed for offside. Defeat means Ipswich's wait for a victory over their arch-rivals will extend to more than 10 years, since a 3-2 win at Portman Road in April 2009. Lambert took Norwich from the third tier to the Premier League with back-to-back promotions, and is the only man to manage both East Anglian sides. A frosty reception was expected before the game, with Lambert leaving Carrow Road to join Aston Villa in 2012, but he had insisted before the match that he would not be fazed by any taunts from the home fans. However, a melee ensued between players and coaching staff after Ipswich's Jon Nolan fouled young Norwich full-back Max Aarons near the touchline, with Lambert confronting Norwich head of performance Domogalla. The former Stoke manager was held back by a police officer before being given his marching orders by referee Bankes. Both sets of players clashed again in the closing stages of a fiery match, in which seven players were booked in all.